laffing...your dumping on my 'trash-can' pickguard???? actually I kind of like it...and it only cost $2, you have to trust me that the pix don't quite do it justice, and I was going for an 'industrial' look like the BSB, however if I find a nicer trash-can...who knows!!! That F-Hole is nutty!! Would love one of those, just like a monkey grip. My guitar is currently having work done it by the god Herc Fede. It's (or was) an RG1570, I'm getting; black, red and white swirl, matching headstock, clear pick guard and a red vine inlay up the neck. It's gonna look killer. When it get in back in several months a will post pics of this amazing guitar. 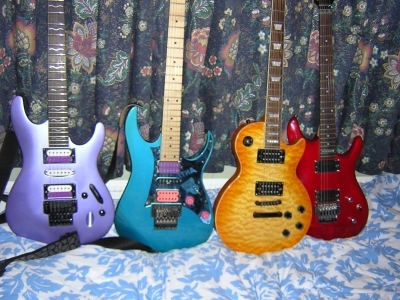 Over the last year or so I've moved to nearly exclusively using Ibanez guitars.......kinda scary considering I was always a HUGE ESP/Gibson fan despite the fact I was a huge fan of Steve Vai & Satch. I've recently offed a customised ESP Explorer (pre-lawsuit), & I've a maple-top LTD Edition Ep. 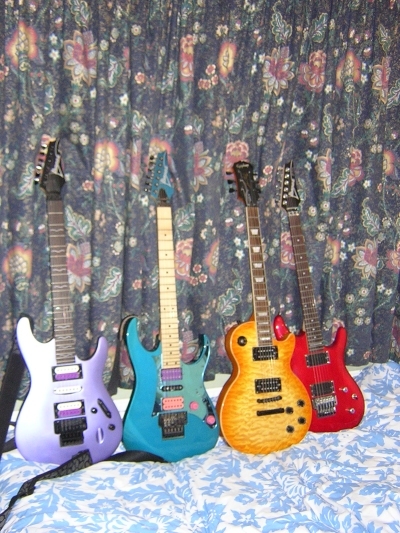 Les Paul loaded with EMG's I'm offing in the next week - needless to say my guitar collection is becoming what I've seen some of you call 'Ibanezi'. I've already spoken ith Jemery from LGM about getting a vine inlay done on the S470 with a 22nd fret inlay - DAMN reasonable price too - just need to gather the essential funds for it. Anyone ever heard of doing mods on Ibanez semi-acoustics or acoustics???? RG670, Infinity pickups, Lo-Pro Edge trem, mirrored pickguard, all hardware changed from gold to chrome since it matches the pickguard better, pau ferro fingerboard, etc. you dont play it much huh? my fret board looked like that when i got it too all dry looking but now its got my wet from long hours on it and its more mapley looking...my 570 looks just like yours minus the pickguard..wasnt guitar on ebay? Yeah, it was on eBay. I just bought it. It hasn't arrived yet, so no, I don't play it much. But rest assured, it will get played. Quite a bit. hmmm i have to ibanez that u could call "modded"
and an rg1527 witha stuck on picasso graphic, i was super scepticle but it came out realy well. Told u guys I'd get pictures up!! 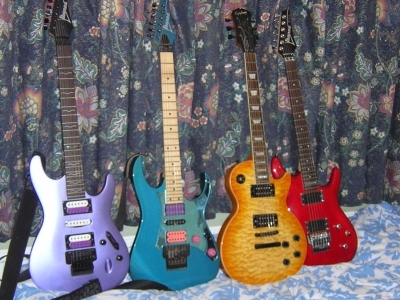 The purple S470 is called 'Heranhi', the blue RG570 is called 'Cerys', the Les Paul is called 'Tiger Lilly' & the JS100 is caled 'Sonia'. Not much visual mods, mainly performance orientated mods here. >$370 worth of parts on a $350 guitar - MIJ 470. Sheilded electronics cavity, with Oak Grigsby switch, CTS pots.